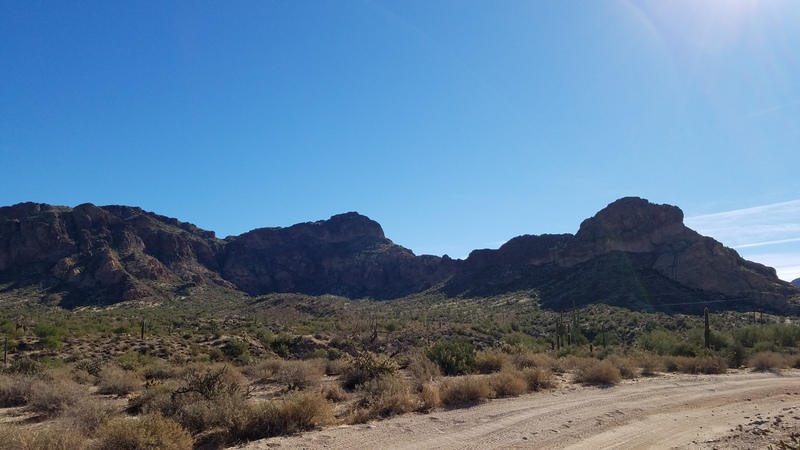 geocaching Bulldog Canyon Arizona – RV Cheaper! 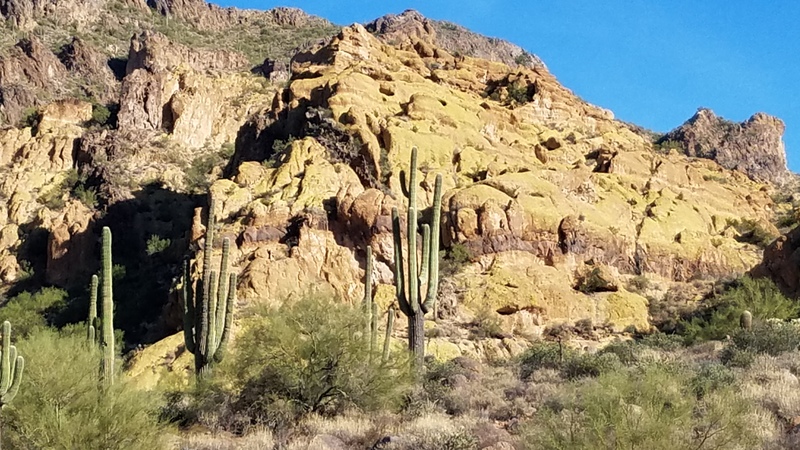 Another place we’ve never stayed before is Usery Mountain Regional Park north of Mesa Arizona. My brother has stayed here a couple times but isn’t fond of the Cholla cactus that frequently jump at their dog Calle. But he was right about how beautiful it is up here. Since about 1998 I’ve been getting 6 month permits to go into Bulldog Canyon during the winter, but something always came up and we never got out there. I used to be in a 4×4 club, we always planned on going but never made it. 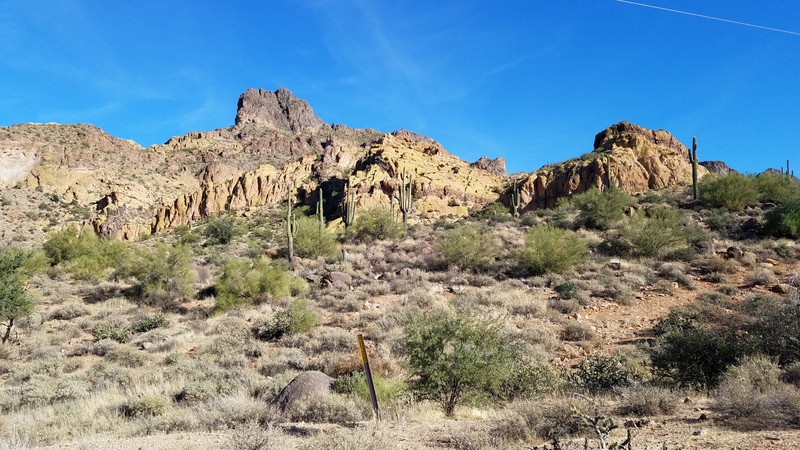 Later we started geocaching and the first cache placed in Arizona was my second reason to go out to Bulldog Canyon, but this December we finally made it! I can’t wait until I retire, maybe we will start doing more of these bucket trips. The weather was great, plenty of open sites, no crowd, I couldn’t ask for it to be any better. I’ve always heard this campground is full in the winter so we lucked out I guess. 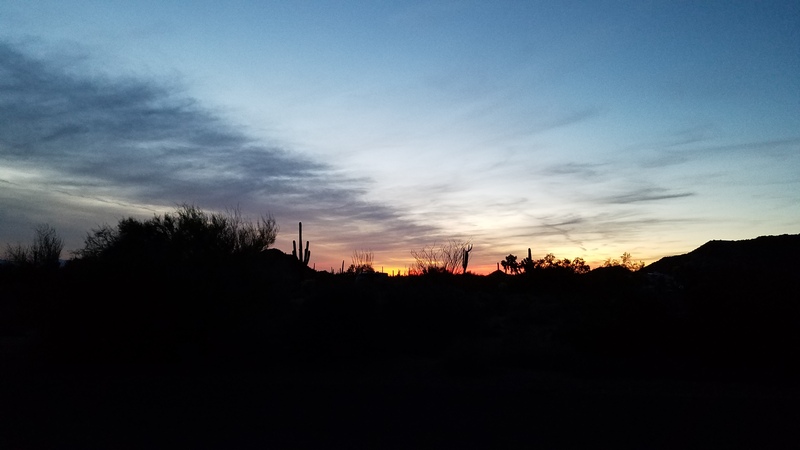 I woke up the first morning to a great sunrise and t-shirt temps. After breakfast we rode the ATV from the campground to the trailhead parking lot. To access on any motorized vehicle you have to request a free permit with combinations for the gate lock that changes every month. They send you six combinations on a form you have to sign and carry with you. 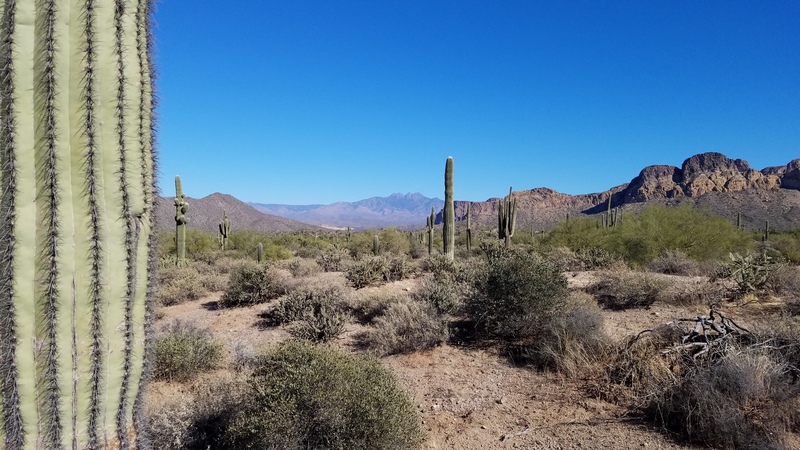 The reason for the permit is to make sure you understand the rules for not going off the marked trails and acknowledge you won’t go on the old powerline roads that are closed off for restoration of the habitat. If you are on horseback or hiking, you can easily get in and don’t need to have a permit on you. one of the narrower sections of Bulldog Canyon following a dry wash. The deep sand and high banks in the turns hints just hose intense the flash floods are here. 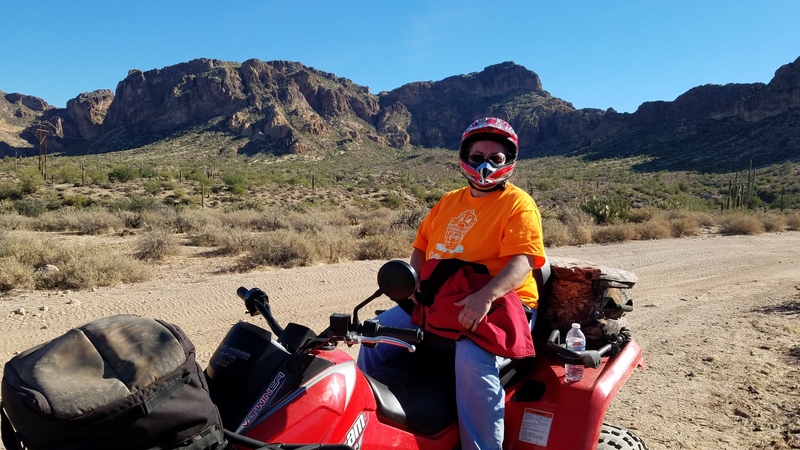 There was one section of the trail that was riddled with boulders that would tear up the bottom of most midsize 4×4 SUV’s, and some sandy sections that probably require 4 wheel drive, those sections bogged me down enough that I switched the ATV to 4 wheel drive. Deep mud is the only time I’ve needed it in the past. Couldn’t be my driving skills were rusty, could it? nahhh…. Using the GPS I found a section of the trail that was the closest to the GC57 Geocache (first and oldest active cache in Arizona). We were .6 miles from the cache so we each took a water bottle and made our way across the ravines and found the cache. To avoid posting spoilers, I don’t take photos at the geocaches. I also wanted to find Pennies from Heaven but couldn’t find the coordinates until I got back to the campground. I found out later we hiked within 200 feet of it on the way to GC57. My app had certain caches filtered out, I’m sure that wasn’t my fault at all… 🙂 My brother says there’s a 100ft circle of pennies around the cache, I would have loved to see that one. After finding the cache we got back to riding, found a couple more newer caches and did some sight seeing through the valleys and canyon. Very scenic, was nice to go riding again. 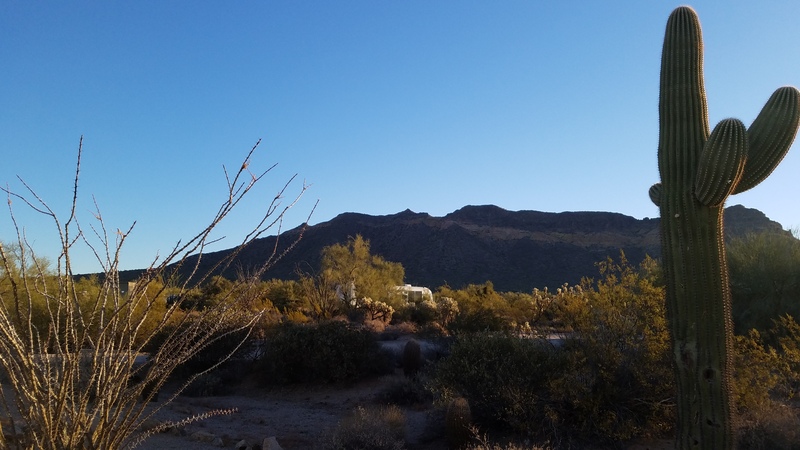 northeast toward the Four Peaks and Salt River lakes below the cliffs in the distance. 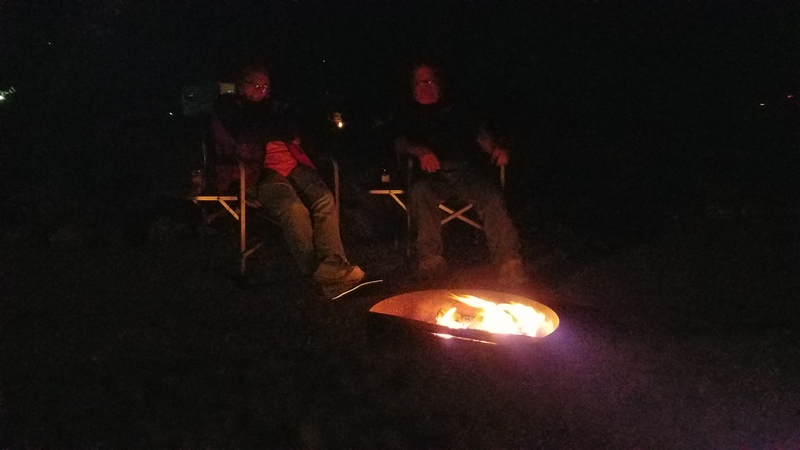 That night we had drinks around the campfire and had a nice relaxing evening. 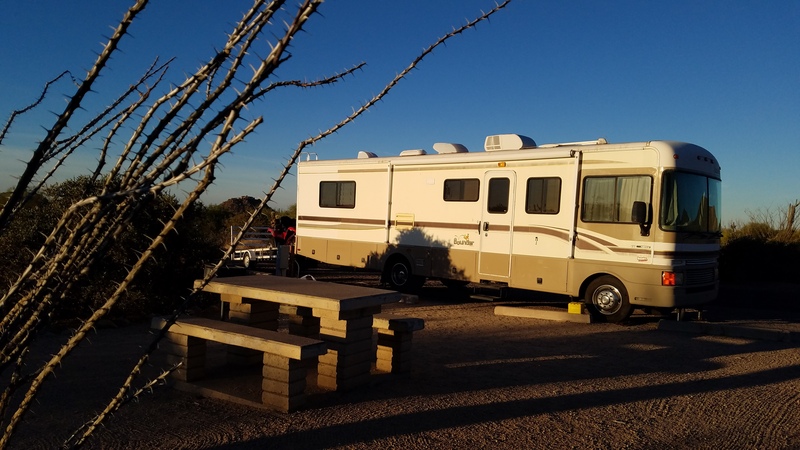 Usery Mountain campground was a very nice place despite being so close to town, if you don’t have pets the cactus are no problem. But have no doubt that Cholla truly jump if you get too close, I have Wisconsin cousins that tested their luck & lost the bet. Cheers! You need to go back and do “Pennies from Heaven” Pre 82′ pennies work best in the smashed penny machines. We have friends workamping at Usery RP this winter. Beautiful place to camp. Glad you were able to snag a site.